About two weeks ago, Elk Grove, Wheeling, and Rolling Meadows High Schools attended an institute day with Eric Jensen about brain-based learning. Throughout the day we explored how the brain works in the context of education and learning. Personally, gaining insight into how the brain best gathers new information and makes connections based on state of mind has been helpful in guiding my instruction. To be honest, when I first saw that we had five and half hours of a guest speaker on the agenda, I was doubtful of my own ability to stay engaged and awake for that length of time. When the day started, the 10 people at our table were able to pick from various roles for the day. Each role required a specific responsibility. Throughout the day, the presenter asked specific roles to engage the group in some way. I had the role of "summarizer" and had to periodically lead a discussion with the group about the main ideas of what we just covered. Other roles in the group included a leader and a someone to facilitate the "stretch breaks." These roles not only held everyone in the group accountable and increased communication, but everyone in the group stayed engaged throughout the morning and afternoon. There was rarely a time period of more than 3 minutes in which there wasn't some break in the presentation that required conversations within the group, movement throughout the room, or back-and-forth feedback. 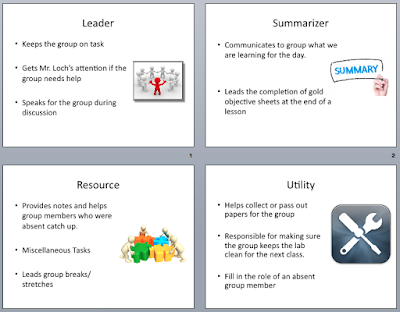 I gave my students the option to pick their roles within the group and made it clear that we would be switching the roles up from time to time. I made sure to have each role engaged at least once for the first few days. I'd be lying if I said that there was 100% buy-in right away. It has taken some time for students to adopt their responsibilities, but I have found the overall affect to be positive. Like any new idea or strategy, it is going to some time to work out the details and I may change up roles or responsibilities as the year goes on. I look forward to the continued use of this strategy in my classroom and hope to shape it in a way that increases student engagement, communication, and ownership. I will follow up with my progress/struggles/thoughts later in the year.